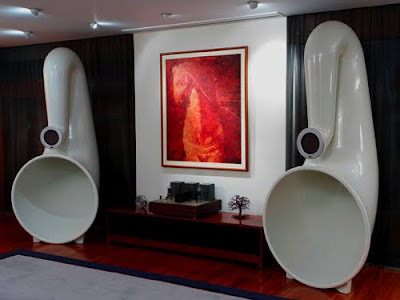 When you designing your home entertainment audio system, you need to be aware of more than just speaker placement. You need speakers that are aesthetically appealing and can be subtly placed unobtrusively in your living room to produce the the best sound without overwhelming your decor. 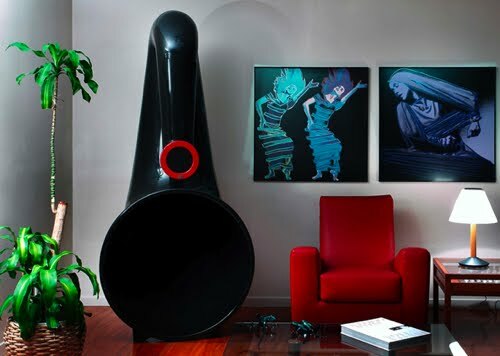 The Pnoe Horn Speakers are not the speakers you are looking for. These bad boys are large and in charge. They are big enough to smuggle at least 4 illegals over the border inside that giant horn. Despite their size, these fiberglass bohemoths only put out 100w of sound. That’s quite a bit but not what you’d expect from speakers of this magnitude. Still, it’s enough for even the most picky audiophile to listen to the smooth musically superior sounds of Justin Bieber at all hours. They come from Greece and there’s no price listed but you probably can’t afford them anyway.